Eustoma russellianum, is a species of flowering plant in the gentian family. Its previous binomial name was Eustoma grandiflorum. Common names include Texas bluebells, Texas bluebell, bluebell, showy prairie gentian, prairie gentian, and Lisianthus. There is a cultivar, 'Bolero Deep Blue'. Eustoma russellianum has blue-green waxy leaves and showy bell shaped flowers in blue pink or white each borne singly on an upright plant. Depending on where it grows it may present as an annual, biennial or perennial plant. It is found primarily in the Great Plains region of North America, from Nebraska southeast to Wyoming, and south to Texas and Mexico. Due to it's popularity and the frequency it's picked, it has been unable to naturally reseed itself in it's native distribution. It prefers moist, sandy soils and often grows near streams or creek-beds. Texas bluebell is a popular garden flower, and has been cultivated in Japan for over 70 years. Many varieties, including those with double petals, or a variety of colored flowers, have been developed. Phyllosticta leaf spot Phyllosticta sp. Pythium root rot Pythium sp. ^ a b c d e f "Eustoma exaltatum ssp. russellianum". Native Plant Database. Lady Bird Johnson Wildflower Center, University of Texas at Austin. 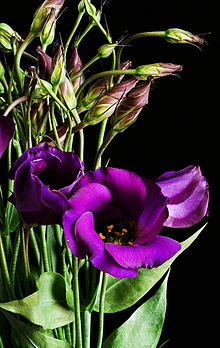 ^ "Eustoma russellianum: Novelty Plant of the Month for May 2002". Flower Council of Holland. 2002-05-01. Archived from the original on 2007-10-07. This page was last edited on 8 April 2019, at 15:09 (UTC).